More adults are planning their funerals than are making arrangements for care in their final years of life. “Experts believe that, like any other long-term financial planning, long-term care planning is the kind of thing you should get started with as soon as possible,” said Jennifer Benz, a senior research scientist for AP-NORC. But for many people, “it’s not even on their radar,” she said. Nearly two out of three adults over age 40 said they have discussed funeral plans with family or others they trust, and more than half have also created a so-called advanced directive specifying how they would like their medical care to be handled if they become incapacitated. Education has historically been the most powerful way for children of the U.S. working class to brighten their futures. But as the cost of college rises, they must climb taller and taller mountains to attend. Work, sometimes full-time, to support themselves or help support parents or siblings. Maintain a high grade point average after poor high school preparation. Inadequate financial aid packages and parents who are unable to help. Parents who may not understand the college financial aid process. Complexities of transferring credits from a community college to a four-year institution. 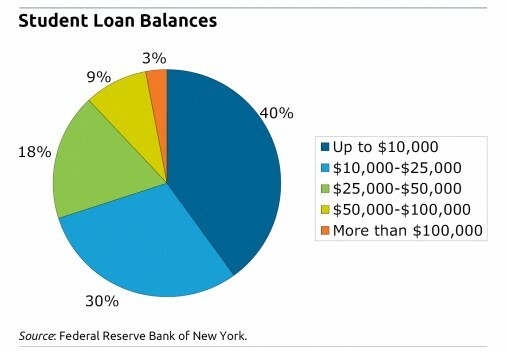 About one in three Americans trying to pay down their student loans is 90 days or more late on their payments, according to a new report by the Federal Reserve Bank of New York. This is up sharply from a decade ago, when one in five people in repayment was that far behind. The Federal Reserve estimates that 31% was the “effective” delinquency rate in 2012; it applies only to people who have actively been in repayment. The bank said this rate is a more accurate measure of the problem than the widely reported rate for 90-day delinquencies – 17 percent – which includes all borrowers, including current students and those who’ve been granted some type of loan payment deferral. The report, “Measuring Student Debt and Its Performance,” provides more evidence that college debt is a major financial burden for a growing numbers of Americans. Between 2004 and 2012, the number of people borrowing for college has nearly doubled to about 39 million, and the total debt outstanding has nearly tripled to $1 trillion and now exceeds the nation’s credit card debt. Delinquencies, by any measure, are higher for student debt than for any other type of U.S. consumer debt, including credit cards. The pace of delinquencies is also accelerating, according to the Federal Reserve. 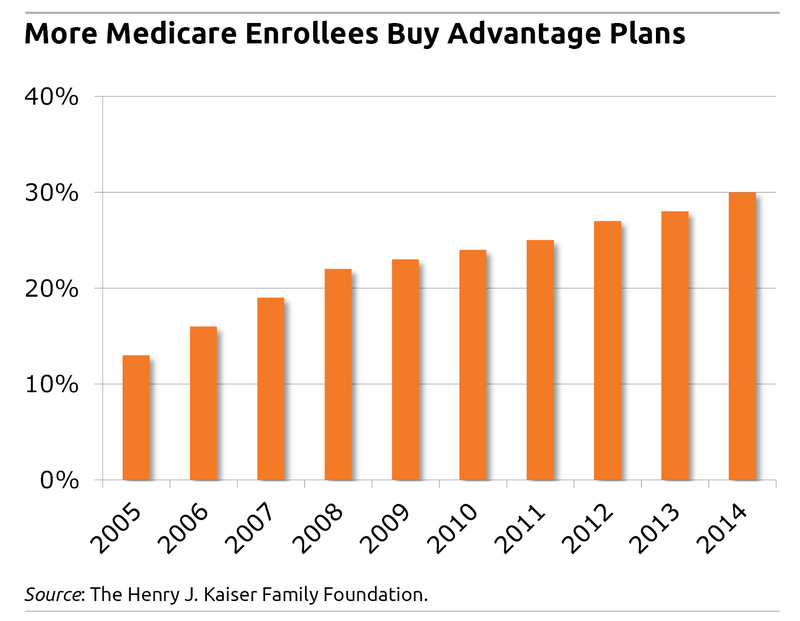 Enrollment in the Medicare Advantage plans that private insurers offer as an alternative to traditional Medicare coverage has more than doubled over the past decade, the Kaiser Foundation reports. The share of the Medicare population enrolled in these private plans is 30 percent, up from 13 percent in 2005, the non-profit foundation said. The reason for this dramatic growth: Medicare Advantage became a better deal for older Americans in the wake of a 2003 increase in federal subsidies to insurance companies offering the plans. The federal government subsidizes insurers through its reimbursements for the care they cover for older Americans enrolled in Medicare Advantage. Those payments were increased in 2003. Insurers responded by reducing beneficiaries’ copayments and cost-sharing in the plans and by providing medical services not always available to people who enroll directly in Medicare and purchase Medigap policies, said Gretchen Jacobson, an associate director of Kaiser’s Medicare policy program. A new study estimating that just 12 percent of low-income older Americans save in a 401(k) or similar employer retirement plan also suggests that many more would save – if only they could. The researchers – April Yanyuan Wu, Matt Rutledge, and Jacob Penglase of the Center for Retirement Research – focused on individuals between ages 50 and 58 with household incomes below three times the poverty line. That was less than $36,357 in 2010 for a one-person household, for example, and less than $46,800 for two people. The period studied spans 1992 through 2010. Retirement saving primarily takes place in workplace plans. But to participate in a plan, workers must clear four hurdles. First, they need a job. Next, their employer must offer a retirement savings plan. If there is a plan, they must be eligible to participate. And if eligible, they must sign up and contribute. Despite the growing tendency of Americans to migrate around the country for a job or retirement, half of all adults still live less than 25 miles from their mothers. Such details about basic family living patterns were described in this video featuring Janice Compton, an economist with the University of Manitoba, who conducts research on the relationship between geographic proximity to older parents and who cares for them. The vast majority of hands-on caregivers are family members. And elderly women, who tend to live longer than men, are more often the ones who receive care from their children.